A few years ago nearly every residential outdoor speaker was installed under the eaves of the house. This not only was a convenient place to install, it protected them for the weather to some extent. As many of these speakers were merely weather resistant as opposed to weatherproof, locating them this way substantially extended their life span. There are, though, downsides to such a location not the least of which includes noise polluting the neighbors with speakers aimed at their houses and yards. 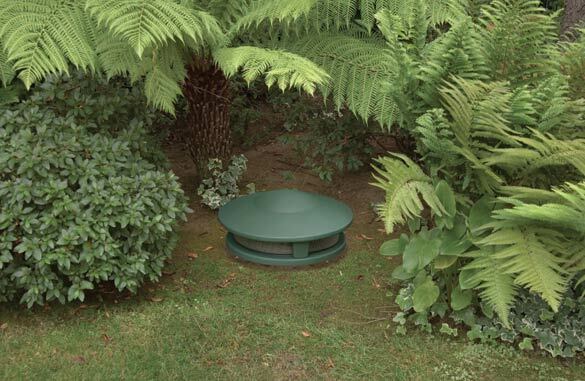 If you are serious about outdoor sound like we are, you are only dealing with truly weatherproof products like ours. Using such products frees you up to consider other creative locations for speaker placement. As in the past, we recommend mounting enclosure speakers on the periphery of the target area, facing inwards as opposed to outwards. With proper placement you will get excellent coverage of the listening area with a dramatic reduction in noise pollution for the neighbors. We also strongly encourage you to consider monaural sound (mono) instead of stereo for any distributed audio system. That way everyone hears all the music all the time as there is no left, right or stereo sweet spot. Mono is also an easy entryway to 70 volt systems. And don’t forget light commercial distributed audio systems are ripe for mono 70 volt installations. If the source components involved don not offer a mono output you can always use an aftermarket stereo to mono converter (and level corrector if you’re using pro-sound amplifiers). We sell the RDL-TX-2 active unit that adds a volume control too. There are others available as well. In typical installs with speakers spaced around the perimeter of the listening area you should figure 12 to 15 feet between speakers. The majority of speakers should be aimed directly at the listening area and at seated ear level. If the speakers you are using tend towards the bright side, aiming them above or below seated ear level may help to compensate. Of course, we always suggest you use speakers like ours where output isn’t colored one way or another, but that may not always be possible. It is okay to place speakers at ground level as long as you can aim them up at the listening area. With ground level placement you will also get a little boost in bass response due to the proximity of the speaker to the Earth. The Terra LS.32 light and sound bollard and the LS.10 ground mount speaker have their co-axial drivers mounted internally at a 35 degree up angle to compensate for their low placement so all you have to do is aim them at the listening area. 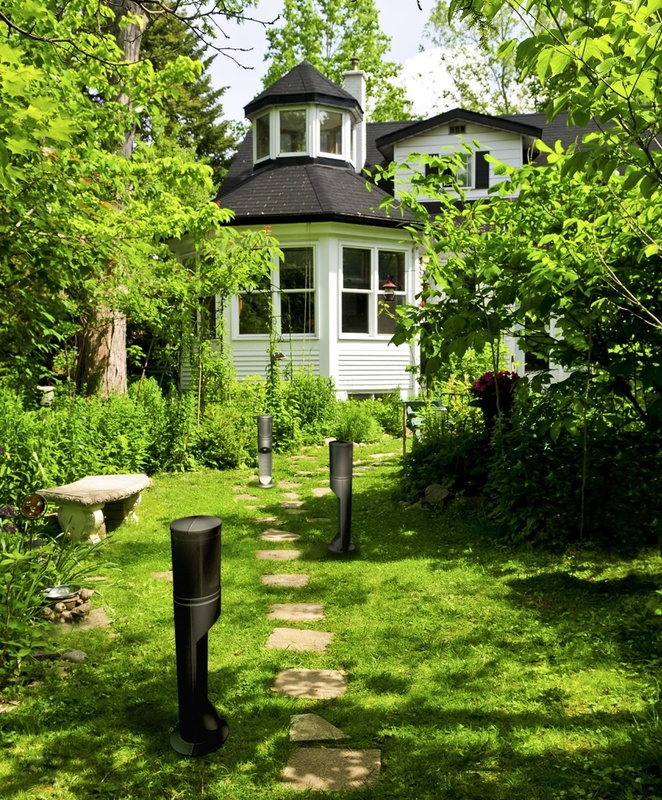 Over the last few years several companies have introduced outdoor speakers designed to look like traditional outdoor lights. The idea is that they will be mistaken for lights and understood to be less obtrusive as a result. Several of these systems include a subwoofer and some are 70 volt. There are lots of these systems out there and their quality ranges from excellent to profoundly mediocre. We consciously decided to go our own way by introducing the LS.10 ground mount speaker. This unique all-climate model is essentially the audio section of the LS.32 light and sound bollard. The LS.10 mounts directly at ground level using a heavy-duty 12-inch PVC pipe. 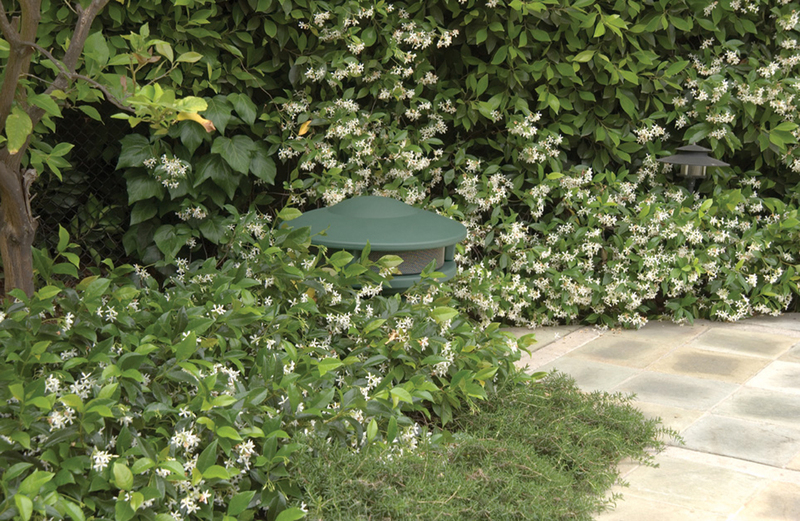 The LS.10 is perfect for locating within the landscaping and it can be ordered in black or green to enhance its stealth ability. LS.10 includes a built-in high performance 70 volt transformer with an 8 Ohm bypass position. Its 5.25-inch ACAD cast frame driver and 0.75-inch aluminum dome tweeter provide superb fidelity and relatively high output. By itself the LS.10 is an excellent all-climate speaker. Designing a system using the LS.10 is pretty straight forward. If you’re designing for a specific target area place the LS.10s just like you would any enclosure speakers, separated by 10 to 15 feet. If you’re putting together a package with speakers spread throughout the landscaping you can put the LS.10s just about anywhere within the landscaped area. Remember the LS.10 isn’t omnidirectional so it needs to be aimed at the listeners. As with any speaker, placing the LS.10 behind dense plantings will block a significant amount of its output, particularly in the higher frequencies so try to ensure that there’s a reasonable line of sight from the speaker to the listening area. The low frequency output from the AC.SUB makes it difficult for listeners to localize. Therefore it can be placed throughout the speaker area with good results. Like with any subwoofer, boundary reinforcement will increase its apparent output so placing it next to a wall or a building will make for more impact. We recommend a crossover of 100Hz or below for the AC.SUB at 18dB/octave. This will work well with all Terra speakers and most other high quality 5.25-inch or larger satellite speakers. When combined with the AC.SUB, the LS.10 makes a dramatic full range landscape speaker system that you can hide in plain sight while making your clients ecstatic over their outdoor sound system. Since the LS.10 perfectly matches the LS.32 light and sound bollard you can design systems to include bollards with LS.10s for superb combinations of landscape lighting and outdoor sound. And just think, you’re proposal won’t include a clone variation of the dozens of other outdoor packages on the market today. If you are not already doing so, please check us out on Facebook and Follow us on Twitter!